I’ve lost (a little) control of my life. If you like what we do around here and can afford even just $1 per month, consider supporting our Patreon! It pays our bills (haha! *weeps*) and you can get access to fun stuff like behind-the-scenes comic work, early comics, exclusive podcasts, and a blog! We release about 8 comics per month, so you’re free to decide if you’d like to support all of them or just one or two comics at a time. We’re incredibly grateful either way! Sometimes, sometimes being stressed out is a good enough reason to buy something. Hopefully you’re enjoying it at least. Cooking plenty of tiny foods. I gotta admit, I would have bought it too, stressed or not. Oh my god, that is actually a real thing that exists. Is it functional? Can tiny foods be cooked upon it? The bigger question is does it work, and can you cook tiny food on it? 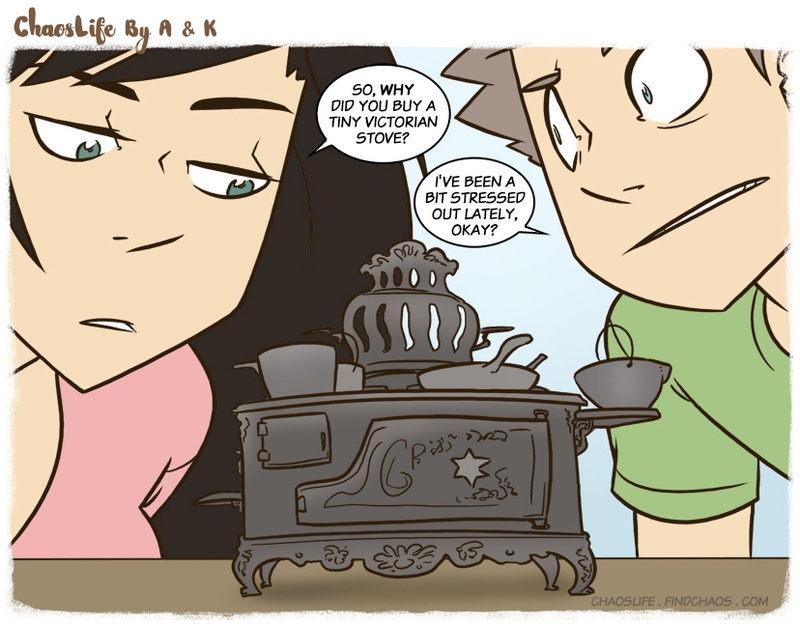 Where did you even buy a tiny Victorian stove?! I want one! 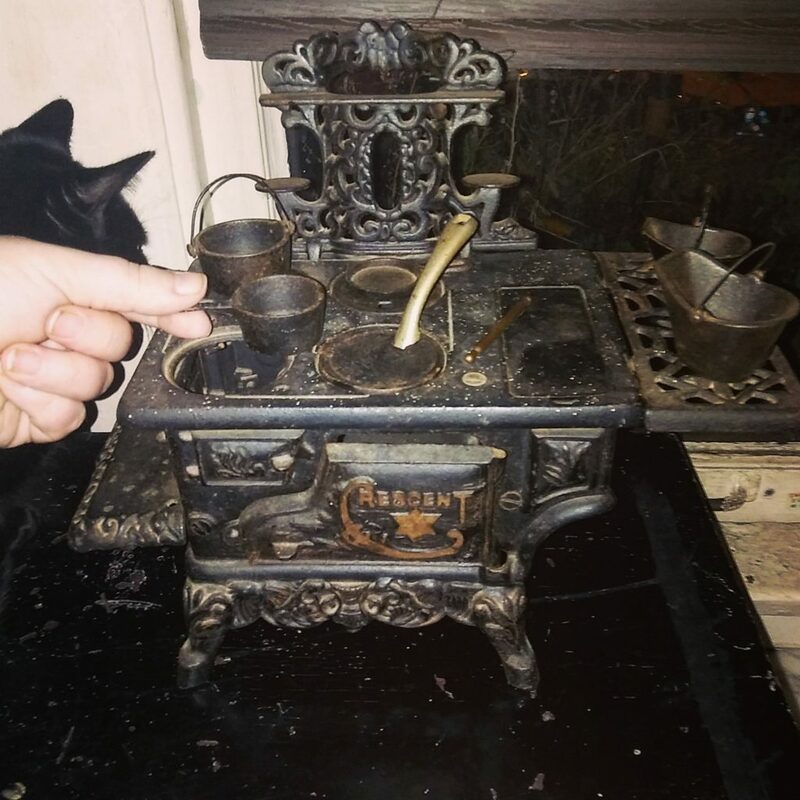 Now I want a tiny Victorian stove in my life. It looks so tiny and cute! I’m not sure what happened to the other parts. With little pots and everything. It makes perfect sense to me. I’d be so tempted to rig it up like a Bunsen burner and beat hell out of E-Z Bake. I bought a Pusheen plushie because I was depressed. I also got my Hark! A Vagrant Pony for similar reasons. Aaaawww!! My grandmother had one of those lying around that me and my cousins used to play with when we were kids. No where near complete, obviously, or we wouldn’t have been allowed to touch it (‘cuz they’re usually worth a fortune nowadays), but it was still a neat little piece. And yes, for the benefit of some of the earlier commenters, you could indeed use one of these to cook “tiny” meals, at least to a limited extent. They’re cast iron and you can build a fire inside it. Makes the whole thing hot, so easy to burn yourself, but yes, cooking is possible. Apparently, my mother and her siblings used it to cook when they were kids. I am so glad you bought that thing!!! That is absolutely adorable! Who wouldn’t want that? Man that’s in way better condition than the one in my family. You will love this youtube channel. This is a formidable way to lose control. These must have been popular in the early 20th century, because my grandmother had one laying around too. I still remember playing with it when I was a little kid. (We only lit a fire in it once and we got in trouble for that. About the fire, the stoves are damn near invulnerable.) I haven’t seen one of those in years.but my grandmother’s looked just like the one in the photo. I just binge read all of your comics with the same enjoyment and enthusiasm I have when I read the complete works bill Watterson or binge read 20 years of Garfield! Thank you for the 4 hours of maniac giggles and oddly time snickers that had my family concerned for my sanity. Really, the question answers itself. Why *wouldn’t* you buy a tiny Victorian stove? But where is the victorian doll house to go with it? I just started reading your webcomic and I had to say that it’s hilarious and I love it so much. would love to see more of the tiny victorian stove. also more comics in general!! Just stumbled onto this last night thanks to the “You’re gay!” peacock strip linked on icanhazcheesburger, and then I spent all night reading the entire archive of both your comics. Amazing, wonderful stuff… I love you two. Your relationship sounds really amazing too, you’re little moments and interaction in this comic are really heartwarming. One thing (you don’t need to reply to me directly, but I thought I’d point this out so you can clarify elsewhere on the site later), did the wedding already happen, or is that still TBD? If it did happen, is there a page or site with pics, footage, etc. available yet? So, erm. I haven’t seen y’all update in a while, and I know one of you guys have been sick. I hope everything is going okay!